Mustard yellow is one of those colors that I have stayed away from for a long time. A few weeks ago I saw a post from one of my favorite blogs FreeUrCloset about Must Have Mustard and I will admit, I was inspired! I played it safe with the mustard trend wearing a tank top, I am still not sure how I feel about the color, I love it on other people, but I’m not sure if it is for me. Navy three-quarter sleeve cardigan from Gap Outlet, last seen here. Mornings are still cool here in Northern California so I thought I would be practical and wear a cardigan. I love the cardigans from the Gap Outlet, the prices are fantastic and they last forever! Mustard yellow v-neck shell tank top $6 Target, bought a few weeks ago. I feel like it is best to spend a small amount of money on something that you are not sure about or taking a small style risk on. I was willing to invest $6 minus my 5% REDCard discount on this mustard tank. I think I like the color, it seems a bit garish, but it grew on me by the end of the day. Gray wide-leg trousers New York & Company bought years ago, last seen here. I used to only wear slacks or trousers to work. I think I felt like I was wearing a uniform or my teacher clothes when I dressed in more work or professional clothes, but I like these pants. New York & Company is great for inexpensive work clothes, especially if you are petite! Metallic flat sandals $12 Target, last seen here. These are awesome shoes, buy them in every color if you can! I would if I wasn’t trying to be so frugal! 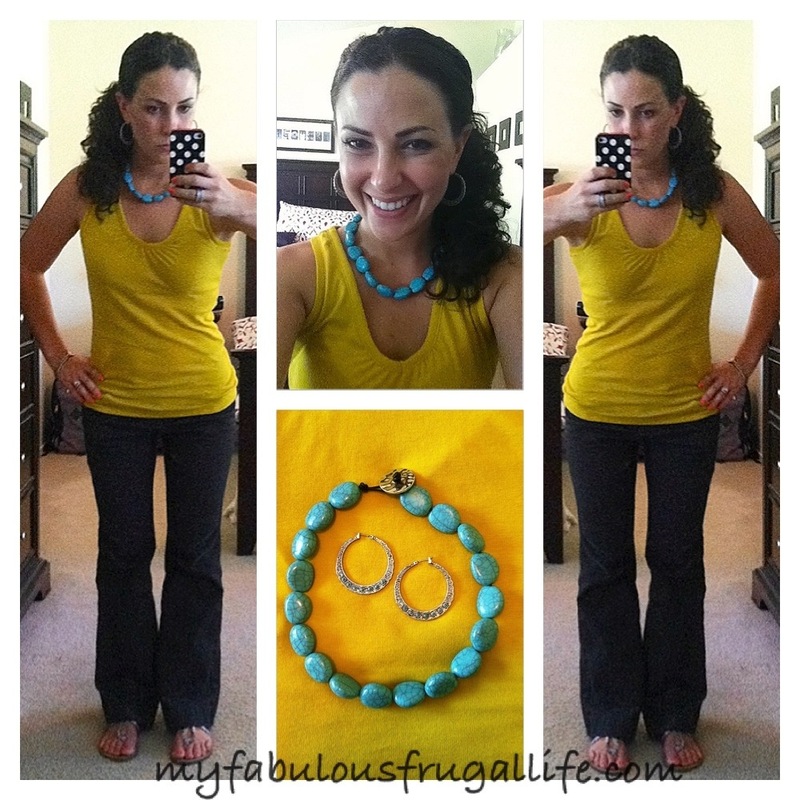 Turquoise necklace and earrings by Ralph Lauren $15 and $8 from Nordstrom Rack, bought in January 2013. I have had these for several months and have only worn them once before, here. I love turquoise! I think the contrast between the mustard yellow and turquoise is really pleasing to the eye. The turquoise is a great pop of color and makes this outfit more spring-like. I had to rock a side pony-tail, I’d been too long! This selfie is me trying to convince myself mustard and turquoise are a good combination. Have you worn mustard? What are your thoughts? Thank you! You two have awesome style and your fabulous personalities shine in your posts! I wish I could blog with my BFF! I cannot wait to read more incredible posts from you two! I think this color combination is great! I really like your necklace, it’s my favorite color! Thank you Laura! Turquoise is awesome! I love it, too! I love the jewelry! Turquoise is one of my favorite stones and colors, both. :) As far as mustard….it looks good on you, but I don’t know that I could pull it off. Thank you! Turquoise is awesome! You are too kind, I’m not sure about mustard either!